[Mathieu] just finished analyzing the numbers from a month of solar energy harvesting. You may remember that he was curious to see what kind of energy can be collected from small solar cells used indoors. He built several copies of a test platform which collected data between December 16th and January 16th. First of all, it’s not shocking to find out that rooms with no sunlight produced negligible energy during that time. When you think about it, if they had been gathering a statistically significant amount wouldn’t that mean the lighting used in those rooms was incredibly inefficient? In other words, there’s no way you need to be making that much light. But he did find that proper positioning in rooms that catch sunlight during the day can result in usable energy for small loads. He established that a 0.5 Watt panel harvested just a bit more than half of what a 1 Watt panel did. But perhaps the most useful discovery was that it’s quite a bit more efficient to have a charging circuit store energy in a battery rather than directly powering a fixed load. It will take us a few more viewings to really decide what we can take away from the experiment for our own projects. But we appreciate [Mathieu’s] quest for knowledge and his decision to put this information out there so that others can learn from it. Instructables user [flapke] has a Kobo eReader and wanted to add some solar cells to it in order to charge the battery for free. The modification is similar to others we have seen recently, though his work was done so well that it almost looks stock. He started out by sourcing a pair of solar panels from DealExtreme that purported to supply 5.5v @ 80mA. Like most of us are inclined to do, he tested them before use and found that they actually put out around 50mA instead. While the performance was a bit off, they still fit his needs pretty well, as the charge current needed to be at or less than 100mA to avoid damaging the battery. He opened the Kobo’s case, and carefully removed a section of the back panel to make room for the solar panels. Once they were soldered together in parallel, he wired them to the eReader’s battery through a Schottky diode to prevent the battery from draining. 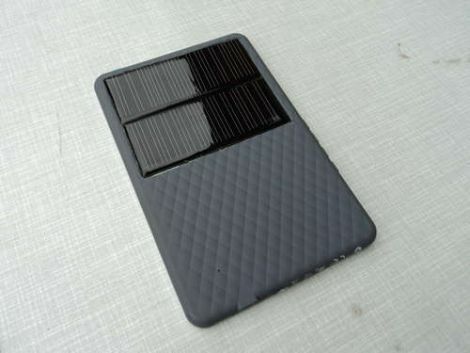 While we think his solar modification is a great way to ensure that he never runs out of juice while reading by the pool, we would certainly add a bit of extra charge circuitry to ours to prevent damage to the battery. What do you think? [Chris] was unhappy with the battery performance of his Rovio. It seems that he’s not alone, so he set out to reverse engineer the battery charging circuit to see if there was a fix. Boy is there, what he found is the diode above, apparently installed backwards when compared to the silk screen diode symbol. Now it’s entirely possible that the silk screen is wrong and this was fixed during assembly. 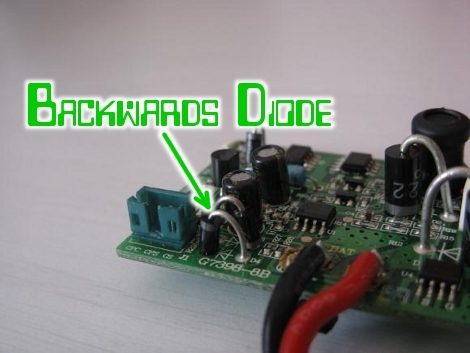 We think that’s unlikely because if the closer of the two diodes was supposed to have the same polarity as the one next to it there should have been room to install them both in exactly the same orientation. [Chris] pulled out a soldering iron and changed the diode to match the silk screen. That fixed his problem and he’s now getting better performance than he ever has.